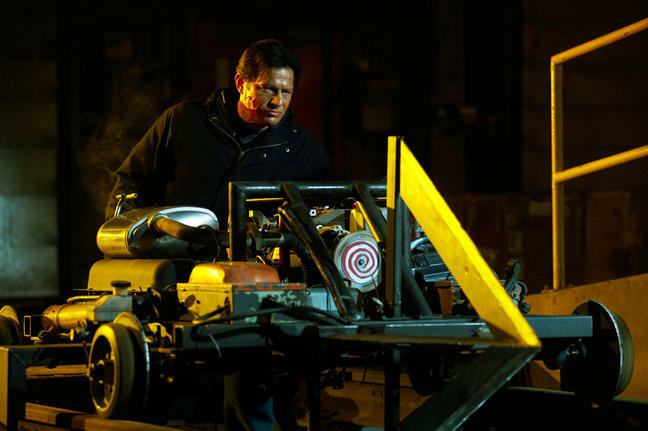 SAW 3-D: Still Slaughtering, Still Not Making Sense – Schlockmania! Another Halloween, another absurdly convoluted entry in the Saw series. Your Humble Reviewer has never particularly enjoyed these films (even the much-praised first entry doesn’t hold up under scrutiny) yet he finds it fascinating on a number of levels. For one thing, it’s the most transgressive and unpleasant horror film series to ever achieve this level of fame and profitability. It’s also been fascinating to watch the contortions that each film’s creators tie themselves in their attempts to convince viewers that it is a fully-realized series with a continuous plot that coherently connects all entries. In the process, they’ve created a set of films that have so little regard for plausibility that they’ve become works of accidental surrealism. That said, the ghoulish fun has run out of steam with Saw 3-D (Saw 7 if you aren’t seeing it in three dimensions). It’s hard to give a plot summary for this film since it juggles six films’ worth of baggage and loose ends while also telling a new story but here’s an attempt: Bobby (Sean Patrick Flannery) is a self-help author whose schtick revolves around the idea that surviving one of Jigsaw’s grisly trap-tests helped him evolve to a higher level of being. Unfortunately for him and his beautiful bride Joyce (Gina Holden), he’s not being truthful about his past and Jigsaw (Tobin Bell) noticed. Thus, Bobby soon finds himself working his way through a real set of gruesome trap-tests that involve peril for himself, his wife and all who helped him in his rise to fame. Believe it or not, that’s only half of what is going on in Saw 3-D. Continued over from the last few films is the story of Hoffman (Costas Mandylor), a rogue cop who became a Jigsaw operative before going rogue again and getting punished from beyond the grave by Jigsaw via his ex-wife Jill (Betsy Russell). Jill turns to internal affairs cop Gibson (Chad Donella), a former rival of Hoffman’s, for help. He tries to hunt down Hoffman before he can get to Jill while also dealing with the latest round of Jigsaw killings. Meanwhile, Jigsaw survivor Dr. Gordon (Cary Elwes) returns from the first film to hover mysteriously on the periphery of this pile of tangled plots. 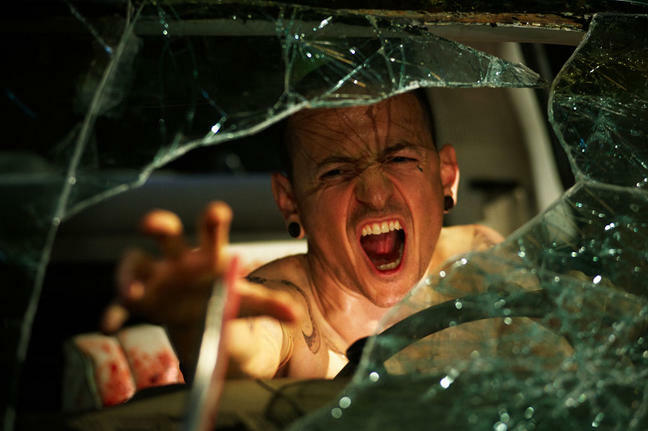 For what it’s worth, Chester Bennington of Linkin Park/scream-singing fame also pops up as a guest victim. If this all sounds as hopelessly confusing as it is grim, rest assured that it is. The secret power of the Saw series is that its bewildering yet fast-moving mass of plot threads creates as much nervous tension in its viewers as the gruesome setpieces. Keeping up with the plot contortions is as difficult as surviving a Jigsaw trap and that generates a level of anxiety that keeps the viewer on edge. That said, the series never plays fair with its audience by paying off (there’s always a few new twists hiding behind any apparent end-point in these stories) and they always leave an open door for the next potential entry. Even this supposed “final” entry leaves that door open and it has a detrimental effect on the coherence of the ending (without getting into spoiler-type specifics, a handful of plot threads are also left swinging in the breeze). To make things even worse, it’s tough to tell which Jigsaw acolyte created what trap in this entry and there’s an opening setpiece that makes no sense because it has nothing to do with what follows. To make matters worse, Saw 3-D is directed in a tired and indifferent manner. Editor-turned-director Kevin Greutert – editor of the first five Saw entries, director of part 6 – returns to the director’s chair but his work seems indifferent (word has it he was supposed to direct another film and producers of the Saw series invoked a clause in his contract to keep him on the series). The resulting film has a professional sheen but basically just goes through its gore-slinging paces. The traps have a joyless predictability to them, doubling down on screaming and gore in place of inspiration. Even the 3-D gimmick doesn’t add much as the film uses it in an uninspired fashion that adds little to the film’s money-shots. You could watch it in 2-D and not miss out on much. The only real entertainment in the film is provided by Chad Donella, who gives the most hilariously awful performance Your Humble Reviewer has seen in a movie theater this year. As the film’s main cop character, he seems to be going for a kind of Chris Walken-style quirkiness but his mannerisms are so clumsy and badly-timed that the result feels like a burlesque of a bad performance. He’s not convincing for a second and he also goes hilariously off the rails during a scene in the film’s midsection where he places Jill in protective custody, where his ranting and raving prompted laughter from the audience Your Humble Reviewer saw it with. Ultimately, Saw 3-D retains the kneejerk shock power of the series but that’s all it has to offer. In fact, those mechanically contrived shocks are the only thing it has left. Jigsaw and his disciples may return again (the lame-duck ending makes it possible) but the producers should take mercy on us and give this misbegotten series some cinematic euthanasia. While I respect your opinion, I actually liked all the films. I have heard the complaint that the films don’t connect or don’t make sense but I’ve seen them back to back before and I can see how one film leads to another. Also, while the opening sequence of 7 had nothing to do with the plot, it did stick with Saw tradition of opening with a trap. I honestly never found any of the plots confusing or tangled in any way and followed them all fairly easily….but then again I’m just a common teenage girl with too much time on my hands and a year late to comments….your opinion probably has more knowledge and research behind it than mine. Hey, to each their own. Thanks for stopping in to share your comments.